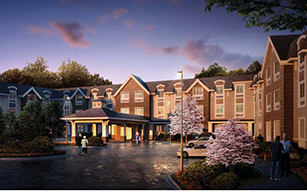 The Ambassador of Scarsdale – Assisted Living Facility offers a great opportunity for affordable assisted living within the Village of Scarsdale. The newly constructed luxury assisted living units have 115 units and includes, four fair and affordable single room occupancy units within two suites. The Ambassador is conveniently located adjacent to Saxon Woods Park. The surrounding neighborhood includes services available to the residents, including a bank, grocery store, pharmacy, senior center, hospital and transportation. The senior center is 2.5 miles from the property, and White Plains Hospital is approximately three miles away. The Bee Line #60 runs on Mamaroneck Avenue, from White Plains to Mamaroneck, where shopping and other services are available. The nearest bus stop is one-half mile from the site and the Scarsdale Metro North Train Station is only 4.5 miles from the site. Each suite includes two bedrooms, each with its own bathroom and closet space, with shared living room, kitchenette and foyer. Eligibility Requirements: In order to qualify for the units, household income must be at or below 60 percent of the area median income for Westchester County based on See HUD Income Guidelines. The maximum income to qualify for one person is $44,000. For More Information and How to Apply: See information brochure English or Spanish. Applications are currently available. Applications are available in English or Spanish Contact the Housing Action Council by e-mailing hac@affordablehomes.org or calling (914) 332-4144.